First you need BIG pots Cause while greens cook down quick they take up a lot of space till they do. 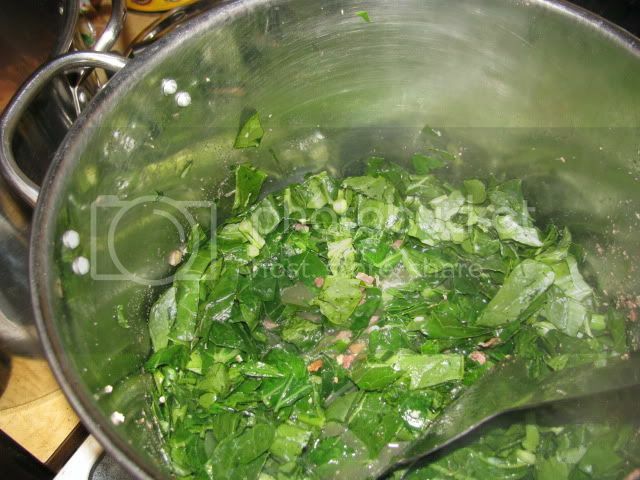 here we start with 12 pounds of pre-washed greens and 9 pounds of Bacon ends and pieces, Honestly 6 pounds would do but I tripled what I normally cook which is one box of seasoning meat to two bags of cleaned greens I now know three bags of greens is closer to the right ratio. but you can never really have too much Bacon. cook you bacon first add about a quart of water to the bacon to get it going and spread the heat. check on it often keeping the bottom scraped well. once the water has reduced off you will be cooking the bacon in its fat which can get a lot hotter than 212 degrees , this will render out more fat keep scraping the bottom, the sugar in the bacon cure will stick and try to burn if your not careful. The Idea is to separate the oil from the cracklings. and leave a clean bottom to continue on cooking the greens. Remove the Bacon from the heat and leave to strain the fat off. the pot will have a lot stuck to the bottom return it to the heat and ad a pint of water, this will sizzle and combined with scraping the bottom retrieve all the good tasting Rue from the bottom. I add 4 cups of the bacon back first ( however in smaller batches I just pour off some of the Lard tasty bacon juice and add water at the crispy stage and scrape off the bottom keeping it all in the pot.) 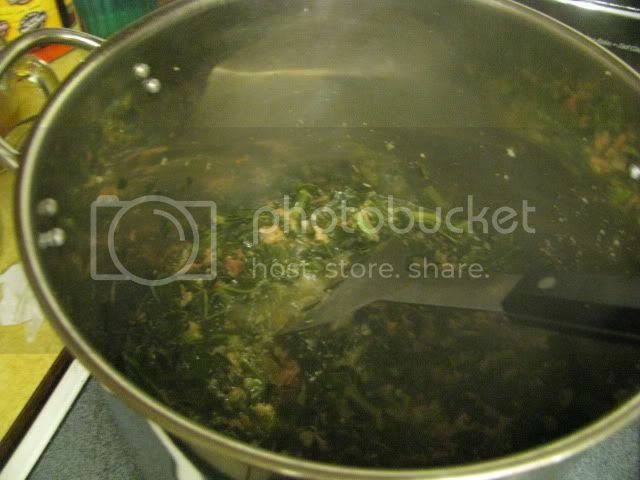 We then add 1 gallon of water, 4 lbs of collards and 2/3 cup of the bacon drippings (this is all that will fit at once.) It doesn't take long for them to reduce down. boil on high another 30 minutes. 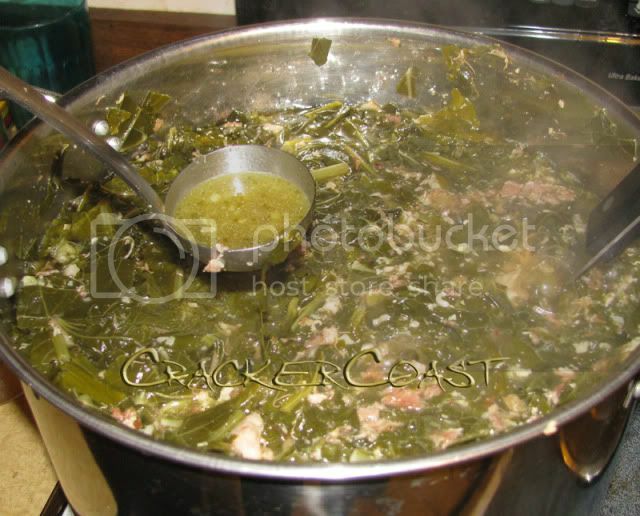 after thirty minutes I wasn't sure I would get the mustard Greens in without a spillover so I started another pot with a gallon of water,the rest of the Bacon and of course the last of the fat Lard Pig Juice that came off the bacon. 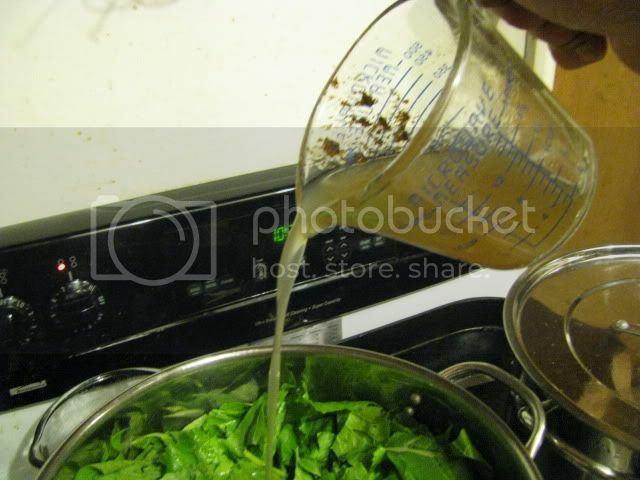 Mustard greens are the most tender and reduce in size fast. Once they were cooked down to size I added them back to the Main main pot and let it boil about and Hour or so. simmer up to 4-6 hours till serving time. Joking Aside this does have a lot of calories, but the free fat has been reduced by nearly half Do not add Vinegar or salt until after the final boiling is done, the pork has a lot of salt, you may find you do not need more. 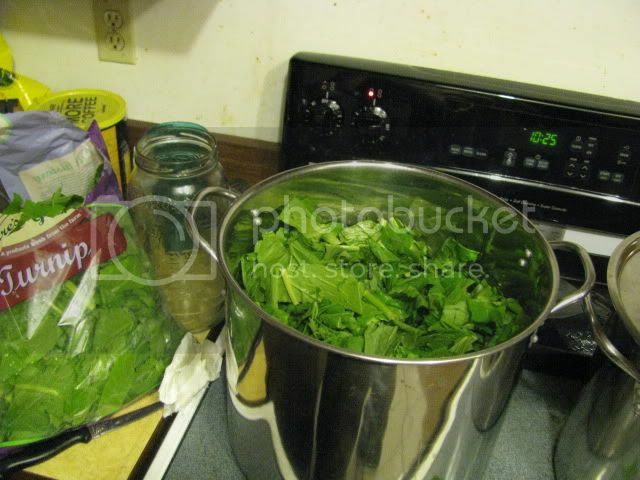 it produces a full 5 gallon pot of greens enough for nearly 50 servings. 1/3 of this batch produces just about enough for me.